The CYMA electric pistols are an impressive piece of equipment sporting full scale heavy weight metal bodies and firing fully automatic. Its quite a pleasure to fire. Now imagine one in each hand. 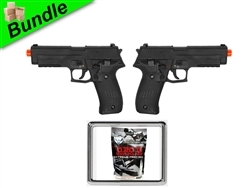 Save and unload a hail fire of BBs with 2 CM122 226 style electric airsoft pistols. Powered by small but powerful rechargeable battery, all you have to do is charge the battery, remove the slide by pulling back on the hammer, insert the battery, reinstall the slide, lock, and then load. 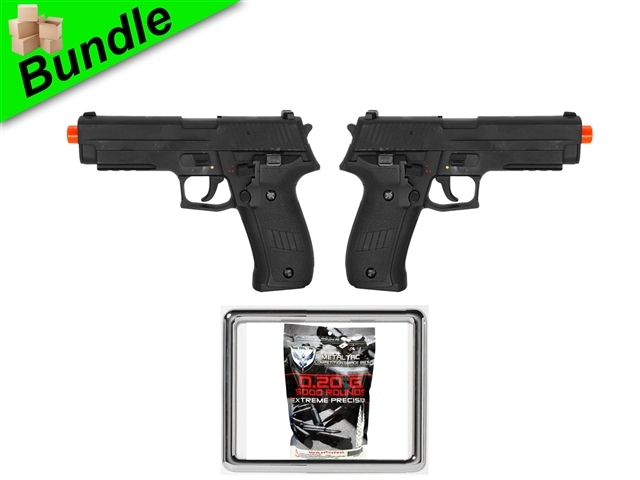 With settings for both fully-automatic and semi-automatic, as well as a functional safety this is a fully loaded pistol. Also included is an additional bonus 5000 round bag of quality 0.20g BBs so the fun never has to end. 200 FPS +/-, 9 RPS on one and 11 RPS on the other. Hop up works, all magazines feed on semi and full auto flawlessly. Definitely not a 1/1 scale. The cm122 is much larger and heavier (thanks to the metal slide) than the cm030 and is also, of course, larger than the Sig 226 it is modeled after. On the bright side, same mag for both the 226 and Glock models. I haven't tried the hi cap mag yet but it looks like it would work. Mag release is less exposed so you should expect fewer problems with mags releasing as you're running around the field. All of the parts that are readily visible (i haven't disassembled yet)are fully compatible with the Cyma and TM Glock so upgrade parts, if you can find them in stock, are available. I highly suggest an upgrade to Lipo for this to improve trigger response and ROF. Chrono'd average of 273 on 5 shots from both pistols. Batteries last a decent time, (shot over 800 rounds before power started to fade). Rear sights appear to be plastic and crush easily if the gun is dropped, but with the rail on the bottom, it isn't much of an issue, as a laser sight is a must have for cqb low light events any way. About to order my 3rd set of these, the whole group carries them.